This new piece from Kraus brings fresh water fast and adds a stylish look to any bathroom. This single-control faucet adds a classy look to any bathroom project. This item's easy-to-install deck mounted design gives a fresh look to any counter top. This faucet is also WaterSense certified to help you and the environment stay clean. This piece from American Standard brings a modern look to many kinds of bathroom styles. This classic single-control faucet is easy to match a lot of bathroom looks. This item's deck mounted design is easy to set up so you can enjoy a finished counter top. This faucet is also WaterSense certified to help you and the environment stay clean. Brand new style meets all-around use in this beautiful piece from Kraus. If you want to renew the look of your bathroom, this single-control faucet is perfect. This item's deck mounted design is easy to set up so you can enjoy a finished counter top. This WaterSense certified faucet saves water and money, but gives you the same clean. Give your bathroom a new look and feel with this piece from Kraus. Finish up your bathroom remodel with this beautiful single-control faucet. Its deck mounted design makes it easy to set up and looks great with many sink types. This WaterSense certified faucet uses less water but gives you the same clean every time. Complete your bathroom with this new, all-around useful piece from Kraus. This single-control faucet adds a classy look to any bathroom project. Its deck mounted design makes it easy to set up and looks great with many sink types. Save water with this WaterSense certified faucet - designed to help keep you and the environment clean with less water use. Aplos Single Hole 1-Handle High Arc Bathroom Faucet in Brushed Nickel with Lever Handle This new piece from Kraus brings fresh water fast and adds a stylish look to any bathroom. This single-control faucet adds a classy look to any bathroom project. This item's easy-to-install deck mounted design gives a fresh look to any counter top. This faucet is also WaterSense certified to help you and the environment stay clean. 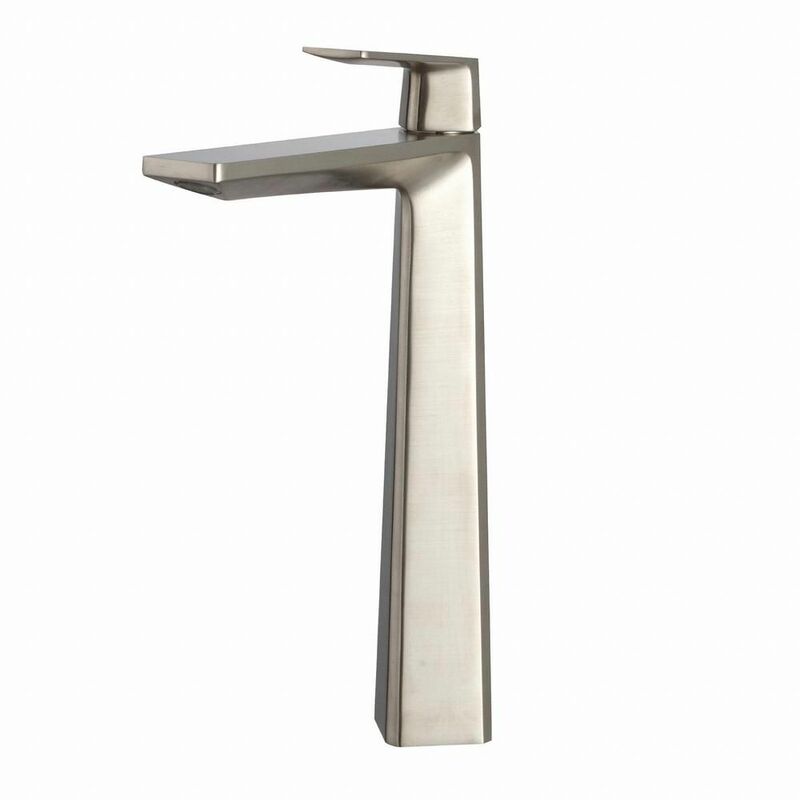 Aplos Single Hole 1-Handle High Arc Bathroom Faucet in Brushed Nickel with Lever Handle is rated 5.0 out of 5 by 6. Rated 5 out of 5 by Karen from What a tasteful, elegant faucet! I just had it installed and it really accents my vanity and bathroom. The design and price are great! I hope that I am as happy five years from now. Purchased it online and delivery was super fast to my house. Love it! Rated 5 out of 5 by Oakgirl from Design AND function Love the way the faucet looks and operates. No splashing and very quiet!!! Rated 5 out of 5 by itsmejude from High Quality Faucet Not only does the faucet look beautiful but the packaging of the faucet was perfect. The faucet itself came in a bag to prevent scratches and also a polishing cloth was included.